The City of Wichita Falls is comfortably nestled in the North East corner of North Texas. Wichita Falls is an economically progressive city home to commerce and industry with worldwide interests. The City also has several institutions of higher learning, a strong international presence through Sheppard Air Force Base, a well educated, eager workforce and a community spirit geared toward family, friends and a desire to see that this thriving city continues to grow and prosper. By most accounts Wichita Falls can be summed up with two words, pleasant and comfortable. This is a family oriented city conveniently located within two hours of two metropolitan areas with populations exceeding one million citizens; Dallas-Fort Worth and Oklahoma City. Wichita Falls has a population of approximately 107,000, is the county seat of Wichita County and considered the population center of North Texas. Our award winning public school system and institutes of higher education are exemplary. 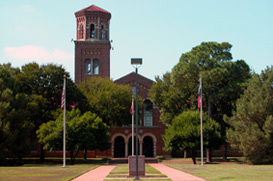 Midwestern State University is heralded throughout the state for its medical, teaching, business and liberal arts programs. The Falls is also known by thousands of bike enthusiasts for the Hotter-N-Hell Hundred Bike Ride. This event is held every August and is one of the highlights of the year. Riders, including professional teams come from all over the world to attend this spectacular ride. Wichita Falls also offers state-of the art medical facilities and services that have made it the health care choice of residents throughout North Texas and Southern Oklahoma. Along with excellent healthcare the City has a lower than average cost of living with affordable, quality housing ranging from apartments to mansions. You can also enjoy the Wichita Falls ballet troupe, museums, symphony, community theaters featuring everything from Shakespeare to rock concerts, professional hockey, skate park, newly renovated municipal golf course, college football and basketball, festivals and fairs, water park, family entertainment centers, nearby lakes and mountains and a Multi-Purpose Event Center with convention facilities, 10,000 seat arena, agriculture building and more. Wichita Falls offers year-round entertainment and activities that are guaranteed to keep you and your family as busy as your schedule will allow.